Broadway tends to lag behind on cultural relevancy and new ideas, exploring issues and themes some significant time after they are at the forefront of conversation in other media like literature and television. This is largely due to the fact that the time it takes for a playwright’s completed work to get on the Broadway stage spans in years, sometimes even closer to a decade. 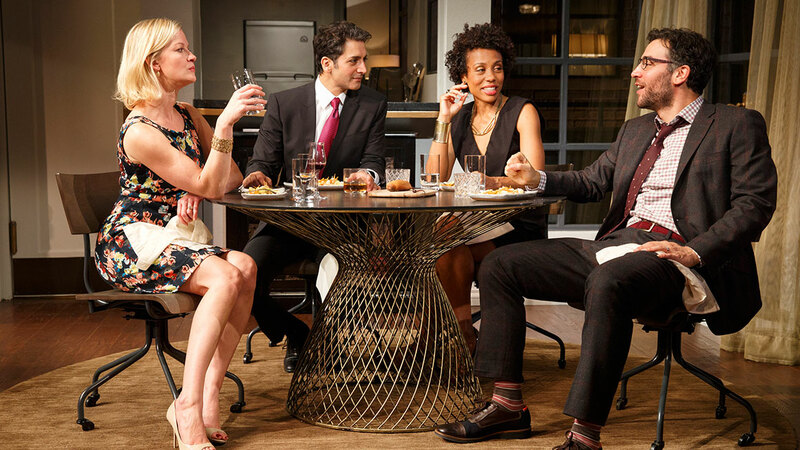 So it must have been exhilarating for the company at Disgraced, which won Ayad Akhtar the 2013 Pulitzer Prize for Drama and completed Off-Broadway and London runs in succession of each other, to be a play whose central topic has been the subject of much discussion in recent weeks. Just two weeks after Disgraced began previews, the internet erupted with commentary a Bill Maher segment in which Maher and his guest Sam Harris argued that Islam is inherently violent and that liberals should not shy away from condemning Islam for perpetuating war and hatred as part of its belief system. Disgraced‘s Amir Kapoor (played by Hari Dhillon), a corporate lawyer in constant battle with his Muslim upbringing, espouses a similar approach to Maher’s, but makes a far more believable and furious defense, using his own destructive experiences to support his claims. Opposing his views is Amir’s wife Emily (Gretchen Mol), an up-and-coming artist whose latest work incorporates Islamic art and architecture into patterned paintings and sketches. In Islamic culture, she finds a certain artistic freedom from Western tradition. Emily invites Isaac (Josh Radnor), the Whitney’s curator, and his wife, Amir’s colleague, Jory (Karen Pittman) for dinner to discuss displaying her work at a new show. Isaac is a secular Jew, a laid-back, self-deprecating liberal who, like Emily, tends to celebrate abstract ideals and cultural diversity, in contrast to Amir and Jory’s cynically-minded preference for facts and critical judgment. Yet, the characters hardly fall into such tightly organized molds. The characters’ resistance to becoming preconceived types is one of the triumphs of Akhtar’s play. Disgraced is far more interested in the characters’ human flaws and failures than in their divisive and intangible arguments. While they may at first seem like mouthpieces for one political side or another, their arguments soon deconstruct themselves and their actions become aggressive contradictions of the beliefs they put forward in the earlier half of the play. If coming into grace signifies a sort of heavenly, transcendent state of renewal and forgiveness, then Disgraced is exactly the opposite. If there is a message of this work, besides the fact that the way we talk about race and religion in our world lacks true nuance and sensitivity, it’s that people under pressure resort to their most atavistic, tribal instincts. When threatened or angered, we reject hope, we reject transcending our subjectivity. We re-enact a clan-like mentality, debase ourselves to animalistic states, and reduce our opponents to their race, class, or religion. Akthar’s play doesn’t exactly provide a hopeful resolution of how to discuss the issues he presents, but his thought-provoking and sobering climax is an important one to see. Disgraced opens at the Lyceum Theatre on October 23.